From casual attire to elegant gowns, Capri have clothing for any occasion. Their mission is to provide the world with fun, flattering outfits that embody sophistication. Your style is unique to you, and Capri understand that women need something with more substance than clothes you can pick up on the high street. Capri’s garments start at a size ten and utilise every inch of the natural fabrics and quirky textures they design with. Shop the Capri range from Beige Plus today and fall in love with style influenced by exotic places around the world, made right here in Britain. The designers at Capri love to draw influence from locations across the globe, from Parisian chic to African prints. Capri is a British plus size clothing brand that isn't afraid to stand out! Their quirky and flattering designs are perfect for special occasions, while the striking prints and layered fabrics are guaranteed to make you stand out from the crowd. Capri are committed to creating clothes to fall in love with, designing their garments for real women. 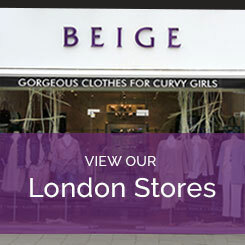 If you would like to know more about Beige Plus or Capri, then get in touch with our advisers today on 020 8455 5888.